We have more than fifteen years of experience, successfully connecting Buyers and Diversity Suppliers. We provide the solutions that you are looking for. ePS partners with Diversity Suppliers enabling them to build capacity, gain efficiencies and participate in any and all eMarketplace environments. Our Diversity Supplier Partners receive the difference maker, ePS Fulfill. This solution provides suppliers with the ability to capture a PO from any eProcurement environment, send back an electronic invoice in a standardized format and receive full reporting services. Our proprietary platform includes a robust assortment of features and benefits. ePS Fulfill is the difference maker for Suppliers. It delivers purchase orders to you and returns invoices to your customers. We can even integrate into your ERP to eliminate manual intervention. The most extensive reporting functionality available by any invoice solution provider allows you to easily report tax, produce aging invoice reports, balance bank statements and integrate into your accounting software. Using ePS Fulfill, you are able to provide Level III line item detail on every invoice. Level III line item detail includes standard information such as billing address, & invoice number, plus Sales Tax, Freight, additional charges, and line item details including part number, part description, unit price and line item totals. Not only does this make your customer happier, it reduces your merchant account fees on credit card purchases! As the technology partner to hundreds of suppliers, we enable any size vendor to support the volume of business produced by large customers through technological efficiency. Fully scalable, we can help you support organizations with ten users or ten thousand. Our platform builds capacity by streamlining and automating basic business processes, allowing you to manage more for less. We have integrated suppliers into all major third-party platforms including Ariba, Peoplesoft, Jaggaer, SAP, Coupa, Oracle, PerfectCommerce, to name a few, plus we can help you manage EDI transactions. Our team is skilled and our practices are proven. We regularly receive compliments from customers on the speed and efficiency of our integration processes. The ePS platform is PCI-compliant and CISP-certified. 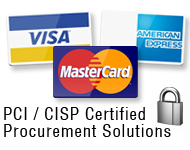 This means that we not only securely store credit card /P-Card information but securely pass the card information on the Purchase Order to you, and then we process the credit cards on your behalf. Your customer's data remains secure at all times. We do not ever expose P-Card information to risk of fraud. Our software is fully scalable, flexible and protected by the highest level of data security. Cloud-based tool allows all suppliers to access the same version of the software from anywhere there is internet access. Access is secured through unique logins. We have designed and developed our cloud-based platform. Our development team is located in our offices in Auburn Hills, Michigan, providing for faster response times, and innovative team-based problem solving to meet your unique business requirements. Our ePS Catalog Manager allows for complex pricing strategies to be applied automatically to price files. You can manage unlimited price files for different customers with different contract pricing structures. Difference reporting allows you to quickly assess any deviations from previous price files. Images and attachments can be loaded into the database or can reference external URLs. Our diversity suppliers benefit from expanded business and your customers achieve their diversity spend targets– it's a true win/win!